The hallowed Helios Type 69, totally re-modeled with Unison™ technology. Whether it was housed at Olympic in London, Musicland in Munich, or in the famed Rolling Stones’ mobile studio, the Helios Type 69 console was at the center of hundreds of iconic albums from rock’s “Golden Age.” From must-own albums by Led Zeppelin, The Beatles, Jimi Hendrix, and Pink Floyd, to Bob Marley and the Wailers, David Bowie, Black Sabbath, and AC/DC, the Type 69 delivered fat, unmistakable attitude, with a punchy midrange and an assertive growl. 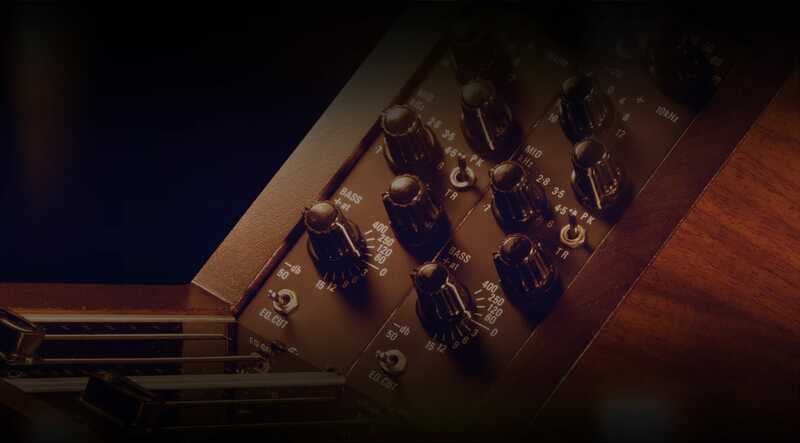 The all-new Helios Type 69 Preamp and EQ plug-in for UAD-2 hardware and UA Audio Interfaces is a masterful, end-to-end circuit emulation of the rare hardware, going well beyond UA’s original Helios Type 69 plug-in. In this video, learn how to shape drums using Helios’ colorful inductor-based three-band EQ and uniquely voiced low-frequency boost and cut filters. In crafting the new Helios Type 69 plug-in, UA’s team of engineers dug deep into two original Type 69 Olympic-era “golden units,” faithfully modeling their custom-made, feedback-style, 70 dB input section — along with a complete emulation of the coveted Lustraphone mic input transformer. This end-to-end circuit capture is the only "triple amp" preamp on the UAD platform, giving you complex, colorful flavors that will make any source come to life. Harnessing UA’s groundbreaking Unison technology, the new Helios Type 69 plug-in gives you the hardware’s line/mic preamp impedance, gain stage “sweet spots,” and exact circuit behaviors. Just insert the plug-in into the Console app’s Unison preamp slot to track in real time through a spot-on Helios Type 69 modeled preamp. The new Helios Type 69 also offers a ground-up redesign of the original hardware’s famously bold passive three-band EQ. For the first time, the Helios Type 69 plug-in perfectly emulates the rich sounding inductor saturation behaviors that keep radical EQ moves sounding ultra musical, even at extreme settings. 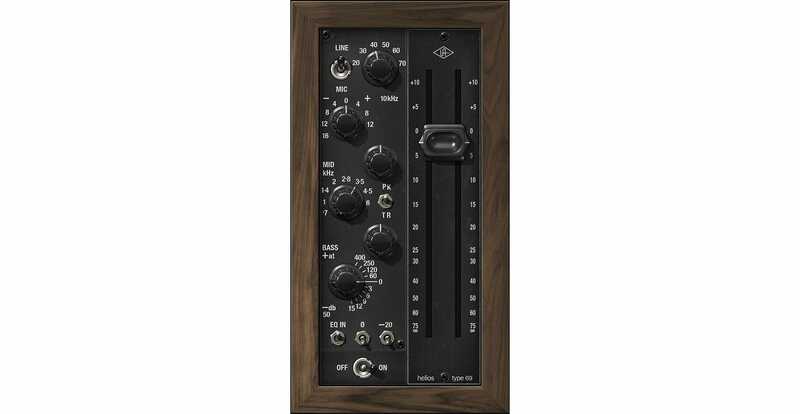 With four uniquely voiced low frequency bell-shape boost filters, the Helios Type 69 Preamp and EQ Collection imparts the same solid and wide bass foundation found on seminal rock, pop, and reggae recordings. You can also clean up sources like overheads and room mics by switching the Bass band into a fixed 50 Hz low cut mode, with stepped gain control. Of course, the Helios Type 69 Preamp and EQ Collection isn’t just for UA Audio Interface owners. UAD hardware owners can use the Collection on any mix, for bold, intense colors, without going outside the box. With the Helios Type 69 complete console channel emulation, plus the included DSP-lite Helios Type 69 Legacy plug-in, you can craft your projects with the same bold flavor found on the biggest records ever made. This is an awesome sounding preamp!!! Great job again UA. Great highs great saturation when boosted!great on cymbals, vocals ,drums. Fantastic job uad you nailed it once again! The vintage soul is in this plug. I’ve even mixed trap music with this plug and the vocals sit in the mix like butter. As I use Windows7 and UAD's installer will not correctly install the device drivers for my system, and hasn't been able to reliably achieve this for several upgrades of the plugin installer distributions, I cannot use the plugin I paid for at all. I gather from the forums several users are stumped by certification errors on UAD's installations. One word... beautiful. Sometimes that’s all there is to say. Thank you, UA. JUST USED IT ON A RHODES AND IT WORKED GREAT TO DISTINGUISH IT FROM THE GUITAR TRACK. EASY TO OVERDRIVE SOUNDS FOR MANY PURPOSES. SO MUCH POTENTIAL. Makes a nice change from Neve on voice and synths. The legacy version rocks, but this is just over the top. Beefy Lows, Shinny Highs, and a lot of Grit. UA has done it once again, this is a must have!!! Very nice sound and energy. I love the bouncy lows and the shine of this preamp, it’s a beautiful and special sound. In a perfect world I would like the 10Khz shelf to be 12 or higher, or even better as selectable, but nonetheless it sounds awesome! UA rocks! Try the 14 day demo, and you will fall in love with the Helios. I love this plugin! I was able to dial in a perfect kick drum and snare with all of the color and character you would ever want for a mix. I am uber-impressed and so very glad I bought it. My new go to for drums for sure! I/m looking forward to trying it out on other elements and maybe tracking with it!